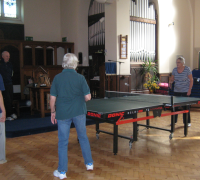 What better place to play table tennis than in a church? 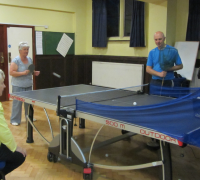 In the summer, I spent long hours invigilating exams in Temple Cowley United Reformed Church, and couldn’t help thinking what a good venue it would be for table-tennis – with the added advantage that it’s three minutes walk from home. So here we are four months later with Cowley Table Tennis offering weekly morning sessions for over-50s and evening ones for all-comers.